Meridian, Idaho – We Have Arrived! With 40+ Craft Breweries in the Boise, Idaho area, there is no doubt that the folks there love craft beer! 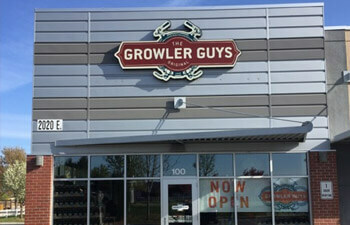 We are excited to announce that The Growler Guys now has a new location in Meridian, just minutes away from Boise! With 54 taps pouring delicious brews, you are sure to find something to tantalize your taste buds. As always, The Growler Guys love to share samples to make sure you are filling your growler with something you are sure to enjoy. For hours, directions and phone number to The Growler Guys Meridian visit our website. We also have a live update of all brews on tap if you want to check our selection before visiting. Come by and say hi, and let us show you why we are the best place to fill your growler in the Boise area. You can also stay up to date on special events by visiting our Facebook page. We look forward to seeing you soon!